One of the most unusual and fascinating genetic defects that do not cause social rejection is heterochromia. 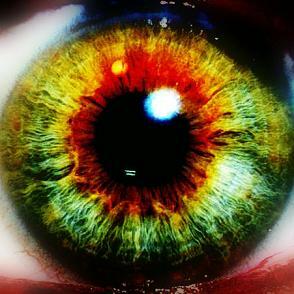 The disease manifests itself by multicolor iris, so that eyes have different, unusual color. Many celebrities decide to wear a two-colored lenses to achieve this effect. There are two varieties of this disorder. First - heterochromia iridis is when one of the iris is multicolor, and heterochromia iridium occurs when both irises have different colors. The cause of this defect is a different color placement of at least the two parts of the iris of one eye and a different colored eyes. This defect is not troublesome and does not cause serious consequences associated with vision. It also occurs in animals. Statistically heterochromia affects only 1 percent of human population. Organ known as the iris of the eye has a number of muscle fibers, which function, by constant narrowing and expanding, is to bring the right amount of light to the lens. Iris color disorder is caused by a genetic defect and is related to the inappropriate content of melanin. It may also be related to hair or skin. It is inherited. Heterochromia is an impressive genetic defect. The patient may have one brown eye and the other one blue or purple iris ring on the hazel color eye . This kind of look is certainly impressive. There are many stars that have heterochromia, for example David Bowie, Jane Seymour and Dan Ackroyd. This disorder is often associated with husky dogs.